We’ve a great programme of activities for October Week, which runs from Monday 11th to Friday 15th. Why not download our poster for the fridge door? Nautical theme starts in the morning with facepainting and baking, and continues in the afternoon when we go to watch the launch of the frigate Duncan at Govan. We’re out all day at the Tower Adventure Playground. It’s a 9 am start for an all day trip to Heads of Ayr Farm Park. We’re out again, this time for swimming at Scotstoun Leisure Centre in the morning and mucking about at Victoria Park in the afternoon … weather permitting! In the morning we’re indoors … baking, tidying the garden and planting bulbs. For the afternoon we’ll be off to Kelvingrove Park, and having a quiz at the Art Galleries. All are welcome … we’re open to all schools during the holidays. Hours are from 8am to 6pm. Cost is £20 per day or £12.50 per half day (Monday & Friday only). Booking Forms must be completed and all fees paid in advance unless paying through the bank. Cancellations will be charged. On trip days please make sure your child/ren are in by 9am sharp – regret we can no longer phone up to remind parents it’s a trip day so if you are late you may miss the outing but will still be charged. 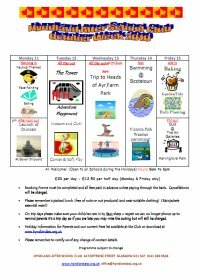 Please download and read our Holiday Information for Parents, Fees List and Booking Form. Please remember to notify us of any change of contact details.